Provide comfort for the family of Bradley Wallace with a meaningful gesture of sympathy. 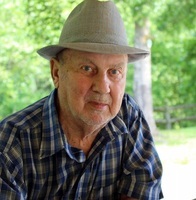 Bradley Wallace, age 87, of Haysi, VA passed away peacefully at home on Saturday, April 6, 2019. He was born in Elkhorn City, KY on February 21, 1932 to the late Taulby and Nancy Cantrell Wallace. In addition to his parents, he was preceded in death by 12 brothers and sisters, a newborn daughter, Carol Wallace and son-in-law, Kenneth Turner. Bradley retired from Clinchfield Coal Company and was a member of the UMWA. He loved the outdoors and was an avid hunter and fisher. In his later years he enjoyed gardening and bird watching. Survivors include his wife of 64 years, Erma Jean Yates Wallace, three daughters, Juanita Joyce and husband Bill Mullins of Haysi, Brenda Charlene Turner and Steve Barton of Haysi, and Jennifer Denise and husband, Kennith Stacy of Hurley, VA, a son, Kelly Charles Wallace and wife Karen of Haysi, three granddaughters, Amanda Carol Turner Paisley of Rocky Mount, VA, Kimberly Dawn Wallace of Haysi, and Sarah Elaine Stacy of Hurley, two grandsons, Bradley Jeff Turner of Haysi and Cody Charles Wallace of Haysi, three great-grandchildren, Ethan Conner Paisley of Rocky Mount, Isaiah Matthan Turner of Haysi and Owen Storm Turner of Haysi, two step-grandsons, Ronald Turner and Morgan (Tonya) Turner, three step-great-grandsons, Morgan Hank Turner, Kenneth Wade Turner and Quinlan Gene Turner. Funeral services will be conducted 7:00 p.m. Monday, April 8, 2019 at Haysi Funeral Home with Elder David O’quinn officiating. Graveside services will be held 12:00 noon Tuesday, April 9 at J.S. Willis Cemetery, Haysi. Pallbearers will be Bradley Jeff Turner, Steve Barton, Benny Yates, Tommy Wallace, Dennis Wallace, Ronald Wallace, and Mike Wallace. Honorary pallbearers will be Bill Mullins, Kennith Stacy, Ethan Paisley, Cody Wallace, and Jesse Yates. The family will receive friends after 6:00 p.m. on Monday at the funeral home prior to the funeral service. Online condolences may be sent to www.haysifuneral.com. Haysi Funeral Home is in charge of the arrangements. To send flowers in memory of Bradley Wallace, please visit our Heartfelt Sympathies Store.